Do you ever feel that blowdrying and styling your own hair at home seems to take forever and more often then not the finished result is a poor reflection on the amount of time and effort you have put into the exercise? Well I know some of you may already know this little secret but to anyone who doesn’t,this little tip can be a major game changer when it comes to increasing the quality of your efforts and significantly reducing the time needed to get a great result. 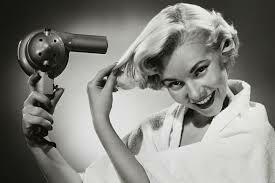 This goes out to anyone who spends more than 30mins on their hair whenever they use a blowdryer. I’m assuming that although useful to people with shorter hair, anyone with hair shoulder length or beyond will reap immediate benefits. The very first thing to remember about styling hair from wet to dry is that the magic happens only at the split second that the hair changes from damp to dry, that is when the Hydrogen bond in your hair sets and whatever shape the hair is in at that moment, is how the hair will appear until it is re-wet again. What I’m talking about is the importance that you don’t start your blow-dry too early, indeed wrapping your hair in a towel for 15~ 20 minutes after washing your hair and before you commence drying will cut down the time you spend on it dramatically. More importantly you will have more energy and enthusiasm to get a nice smooth result rather than exhausting yourself on drying really wet hair only to find that when your at what I call “The Business” end of the process, you have run out of steam and start rushing to get it finished as soon as you can. It’s important that at the “sweet spot” when your hair really needs you fresh and focused for that critical moment from damp to dry,your not feeling like you just want to be done with it which will invariably show in your finished result. Try and get your hair to a pre-dried state where you will only need 10mins to finish it off and get that lovely smooth look that you now know doesn’t need half a morning to produce. Definitely a case of Less being More! Next time your in the salon, pick your stylist’s brain on this and also bring in your brush for us to check whether or not it’s the best possible tool for you to use to get the look your after. So many people struggle with a really unsuitable brush or weak blowdryer that most professionals would find difficult to work with. Good tools first, better techniques next.